Revolutionary design of new Philips indoor floodlight suits consumers to a "tee"
Somerset, NJ – Philips, the global leader in lighting, continues to not only revolutionize LED light bulb design, the company is also setting new affordable price standards with the introduction of the Philips SlimStyle BR30 indoor floodlight at an MSRP of $12.97, making it one of the most affordable LED floodlights available on the market today. Like the original Philips SlimStyle bulb, this BR30 has a brand new, slimmer shape that still offers the high quality, uniform light distribution of an incandescent floodlight, while eliminating the bulky heat sink commonly found on many LED offerings. This value-priced 9.5-watt floodlight will be available online in July and at retail in August of this year in the US. Like the original 60-watt equivalent SlimStyle bulb, the BR30 is designed to meet or exceed ENERGY STAR specifications and has already been submitted for ENERGY STAR testing. By reducing energy consumption by 85 percent, the SlimStyle BR30 offers an estimated $152 in cost savings over the life of the bulb and also offers dimming, making it an ideal replacement to the traditional 65-watt incandescent floodlight. Since the SlimStyle BR30 lasts 25 times longer than the average incandescent floodlight and is well suited for hard-to-reach ceiling fixtures often found in kitchens and living rooms, consumers can now spend less time on ladders and more time enjoying their well-lit homes. Using mid-power LUXEON LEDs developed at the Philips Lumileds facility in San Jose, CA, the SlimStyle BR30 uses just 9.5 watts of power, while putting out 650 lumens. 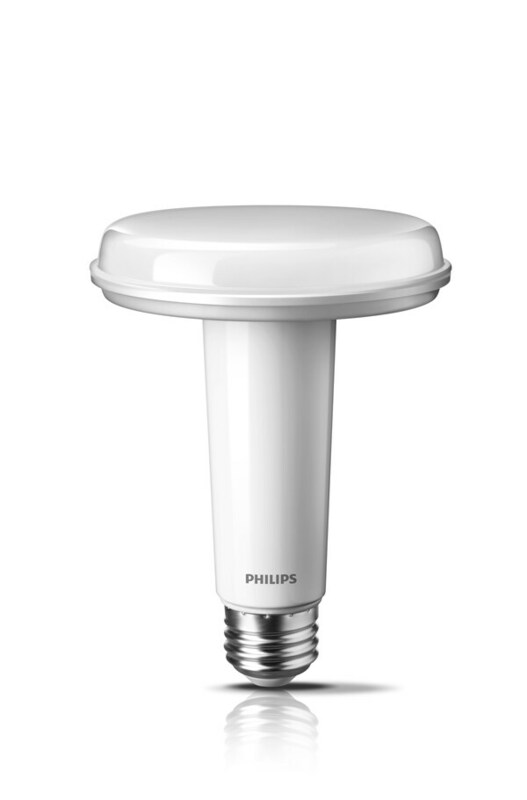 Like its stable mate, the Philips SlimStyle A19, the SlimStyle BR30 bulb leverages its uniquely flat surface to conduct heat away from the LEDs, eliminating the need for the heavy aluminum heat sinks currently associated with LED bulbs. This innovation helps to reduce the cost and weight of the bulb, while still delivering the perfect light distribution consumers expect from Philips LED products. It also means the new bulb is lightweight, making it easier to manage and install. "Over the last four years, Philips has led the charge in making LED bulbs more affordable for consumers, while ensuring that we continue to innovate with every new generation of offerings and the SlimStyle BR30 is no exception," said Bruno Biasiotta, CEO and president, Philips Lighting Americas. "We continue to demonstrate our commitment to giving consumers value-priced offerings, without compromising on the light quality or features they have come to expect. Moreover, we have one of the most robust rebate programs in the country and continue to work with utilities to ensure that we can further drive down the price and save consumers time and money." Philips is the world leader in LED lighting and at the forefront of LED lighting innovation. It provides LED bulbs to suit different consumer tastes from conventional to cutting edge designs. SlimStyle joins a broad portfolio which includes Philips Hue, the company’s connected lighting offering for the home that empowers users to create amazing new lighting experiences and control LED light using their smartphone or tablet. Thanks to Philips’ open development platform, Hue is supported by more than 100 third-party apps. From floodlights to spotlights to decorative candles, Philips offers the broadest range of ENERGY STAR certified LED lamps designed with the latest and most advanced LED technology available on the market. Offering superior light quality that meets customer needs, Philips LED products continue to drive this new era in lighting.